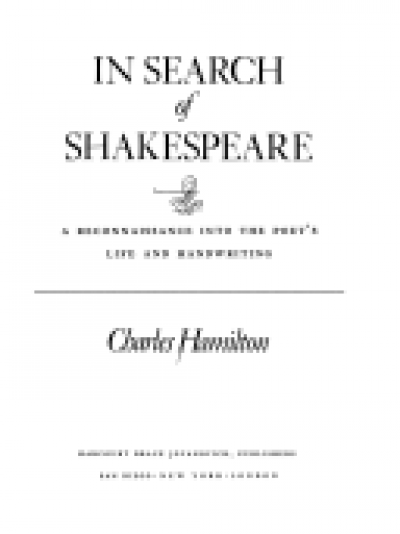 Everyone wants to pluck out the heart of Shakespeare's mystery, and Charles Hamilton believes that he has done so. There is an engaging zest about his account of his "obsession," his search to find records in the poet's hand. He scrambles out of bed at 5 a.m. to hunt through books for a clue, or rises at 12:45 a.m. on a freezing night to seek a document he may have overlooked, and excitedly reports on finding notes in Shakespeare's hand, "A chill shot up my spine, and lifted the hair on the back of my neck." As a "manuscript expert," Hamilton presents his conclusions as "facts," starting with his claim that Shakespeare's will, long assumed to have been drafted by a scrivener, "was in the poet's hand." He goes on to recount a series of other "discoveries" of documents said to be in the poet's writing, notably his application for a coat of arms, and numerous interlinear corrections in a manuscript containing works by Francis Bacon. These finds lead to further speculations about Shakespeare's life and death. Hamilton suggests that besides writing plays and attending to his affairs at the Globe, Shakespeare was also a shrewd businessman, making money as an expert in heraldry and designer of coats of arms. In addition, the Earl of Southampton got him a job as ghostwriter for Francis Bacon, whose "Essays" he helped to compose. Shakespeare is also presented as an artist, who was really responsible for the famous sketch of Titus Andronicus usually attributed to Henry Peacham. As to the dramatist's death, a gruesome plot unfolds, in which his son-in-law, Thomas Quiney, married Judith Shakespeare for money, and murdered her father by administering arsenic, so as to prevent him from rewriting his will. This is all heady stuff, and after his first "discovery," which led Hamilton to leap from his seat and shout "Will! By God. I did it! ", it was perhaps hard for him to resist making many more. That initial find, however, that Shakespeare's will is in his own hand, is the foundation stone on which all the rest of the book is built. Will Hamilton's claim find wide acceptance? Well, it depends on what he calls the "feel" of the handwriting, "the instantaneous impression it creates upon a practiced eye," even viewed upside down. Hamilton might include this reviewer among the "professorial dabblers in autographs" for whom he has little respect, but I remain unconvinced by his argument from general impression. Other experts have studied the detailed characteristics of Shakespeare's orthography, such as the "spurred \o7 a\f7 " found in his signatures and in the manuscript of "Sir Thomas More," but not in his will, and none of them believes he wrote out this testament himself. The book is liberally adorned with reproductions of the handwriting of Shakespeare and numerous contemporaries of his, so that the reader can make up his own mind; and while he is doing this, he can hardly fail to be entertained by such descriptions as that of Shakespeare "curling his lips in contempt" as he realized his son-in-law Quiney was "a worthless bounder."